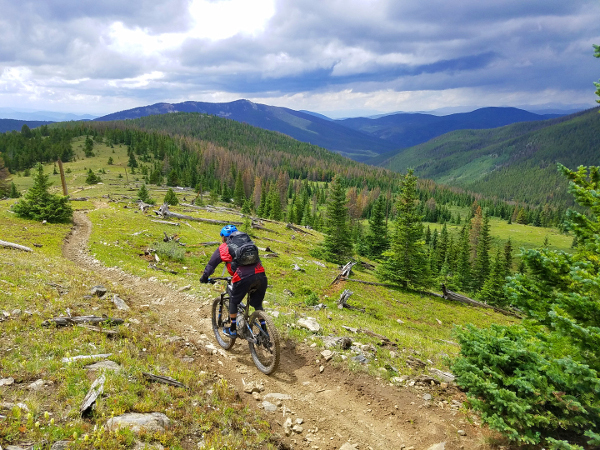 When people think of the mountain biking options on Monarch Pass, the classic Monarch Crest, Silver Creek Trail and Rainbow Trail come to mind. Those who have ventured on alternative routes may also envision Fooses, Greens Creek and Starvation Creek trails. 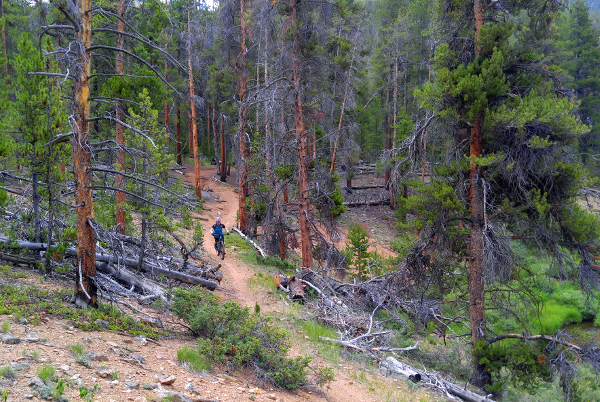 But less people are aware of the fabulous trails that lie just to the west of Monarch Pass / Continental Divide. TrailQuest defines the Monarch Pass / Continental Divide Region by the Continental Divide on the east, the Colorado Trail and Highway 50 to the south, the Fossil Ridge Recreation Area to the west, and Tincup to the north. Marshall Pass, Wuanita Pass, Cumberland Pass, the Alpine Tunnel, and the town of Pitkin are all included in the Monarch Pass / Continental Divide Region. 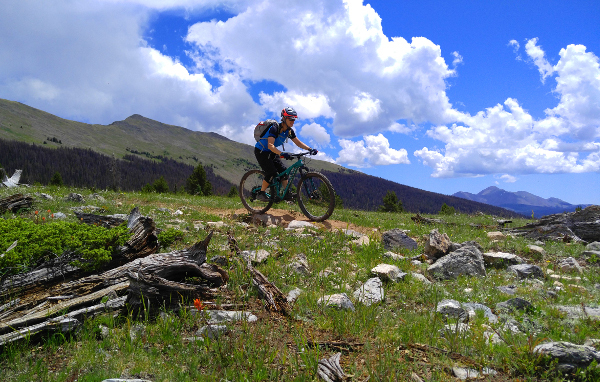 The Monarch Pass / Continental Divide Region of TrailQuest contains some of the best alpine riding near Gunnison and Crested Butte. With so many roads intersecting singletrack trails, shuttle options are easier here – making it a bit more appealing for some. Since this region harbors segments of the Continental Divide and Colorado Trails, you’re likely to find many thru-hikers passing by. It’s also still easy to get off the beaten path and have entire trails all to yourself! Every time I take a friend on this ride, their comments are the same. Something along the lines of – “Wow this descent keeps on going and going!” or “This ride is kick-a**!” No one has ever been disappointed, and for good reason! Canyon Creek Loop has it all. From cemeteries, to peaks, to scenery, to fun riding, this ride is a long-overlooked but increasingly popular classic! 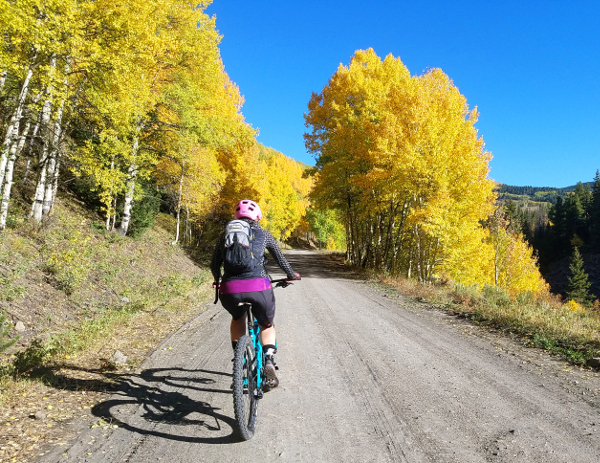 From Snowblind Campground, we first began our ride on a dirt road (County Rd 888), passing through the sleepy small and historic town of Whitepine. From there the road got increasingly steep and rocky. After passing by a very cool, historic cemetery, the road steepened more to become borderline rideable. After almost 8 miles on this road, we hopped onto singletrack for the final 1.5 miles to the top (Don’t worry, the ascent is definitely worth it). 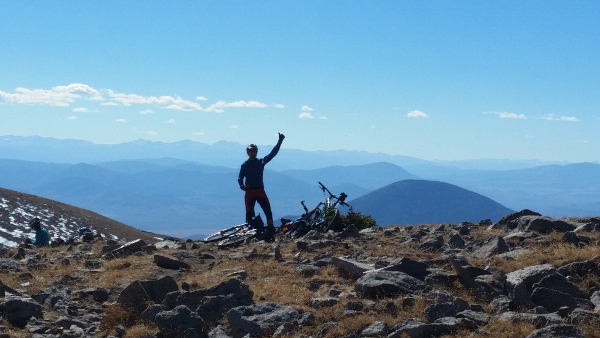 We dropped the bikes at the top of the trail and walked over talus for a few minutes to gain the 12,612-foot summit and enjoy the views of the Sawatch. 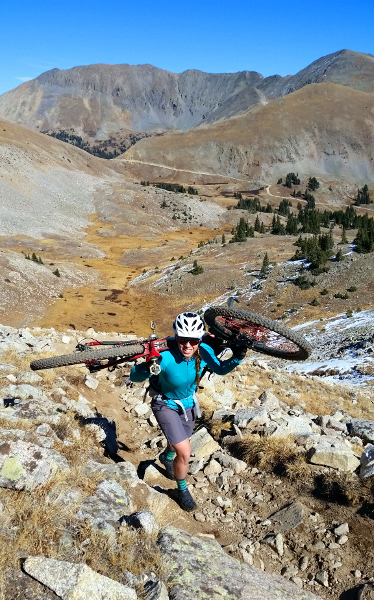 From there, the real fun began – over 3300 vertical feet of descending over 10.5 miles. The descent first begins in the high alpine. After 2 miles, we reached treeline where the already great descent got even better. Once we crossed the Canyon Creek at mile 15.25, the riding was less steep, but still incredibly fun. A short uphill and another splitter downhill brought us back to our car parked near Snowblind Campground. 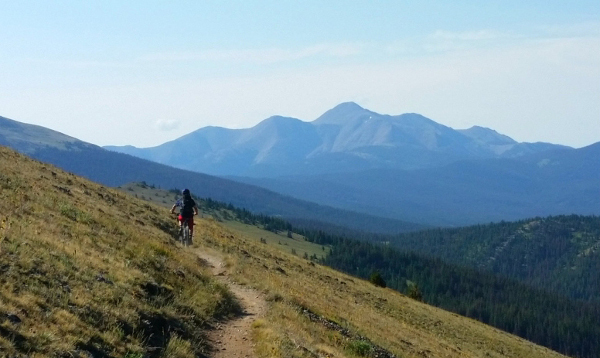 BONUS: If you can find a way to work Waunita Trail into the mix, it’s absolutely worth it! 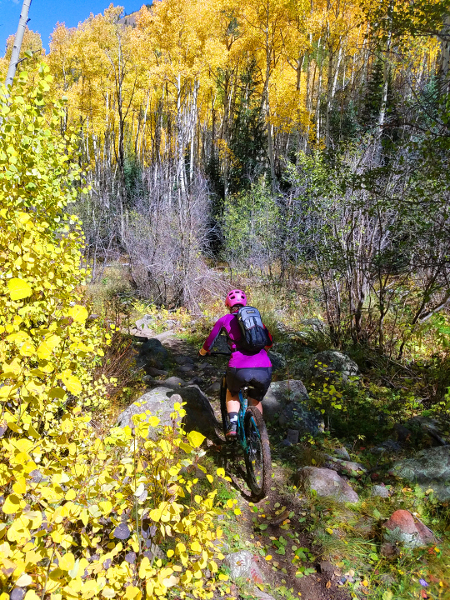 Tank Seven Creek Trail is a lesser-known trail that drops north from the Colorado Trail between Sargents Mesa and Marshall Pass. Thru-hikers and bikers are usually familiar with the location of this trail intersection as it marks one of the only places to get water for miles. The techy descent of Tank Seven is both fun and scenic. There are many ways to ride Tank Seven Creek Trail. 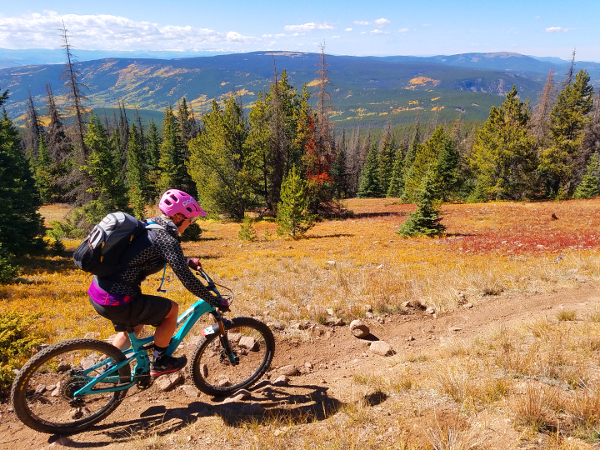 Aside from riding it as an out-and-back, combining this trail with Marshall Pass and the Colorado Trail puts together one of the better loop options. We left our car at pullout near the bottom of Tank Seven Trail and began ascending Marshall Pass Road. The railroad grade made for some fast pedaling for a little over 10 miles to the top at 10,842 feet. From here, the ascending was not yet over. We continued south on the Colorado Trail which climbed for another 5.5 miles, passing by Silver Creek Trail, the traditional Monarch Crest descent. This section of the Colorado Trail is very scenic! 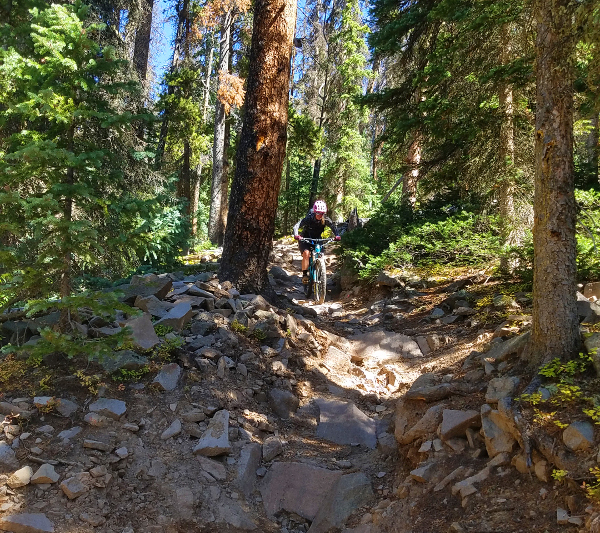 The Colorado Trail then began a steep and technical descent for 2 miles after which the technical riding continued but the trail was very “cross-country”. Another short descent brought us to the start of Tank Seven, 11.5 miles past Marshall Pass. Tank Seven offered us close to 4 miles of fun, mixed flowy and technical descending, following the creek the whole ride. A short climb led to another quick descent, opening up to a colorful sagebrush meadow for the final stretch of the trail. This loop can be shortened with a shuttle. Light 4WD vehicles can easily drive to the top of Marshall Pass, saving the 10+ miles of climbing on the road! Dropping on the west side of the Continental Divide, Agate Creek Trail may be the most overlooked descent option off the Monarch Crest. Yet, with it, riders get the best parts of the Crest plus a nearly 3000 vertical feet of sweet descent down beautiful singletrack! It’s my favorite descent off the Monarch Crest. 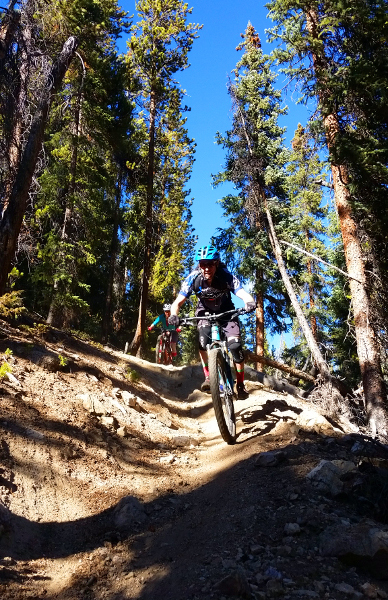 As with most rides on Monarch Pass, Agate Creek Trail is typically best done as a shuttle. We left one car at the obscure Forest Service Rd 799 at the bottom of the trail on the west side of the pass. From there, we drove to the summit of Monarch Pass where we began our ride, heading south, soaking in all that the beautiful Monarch Crest Trail had to offer. After 8 miles of mixed ascending/descending on the Monarch Crest we reached the intersection with Agate. The descent begins with beautiful alpine scenery. But, then it quickly slips into the trees. For 7 miles the trail is absolutely spectacular. Then it starts to cross the creek multiple times. In low-water years, many of these crossings are rideable. High-water years make this more difficult. Either way, these crossings can disrupt the flow. If you come prepared to get wet, even this stretch of trail has its fun. For the last few miles of the trail, we could hear the roar of highway vehicles above us. Yet we were so far down in the valley below we could not see them. Agate Creek Trail ends with a quick hike-a-bike that climbs out of the valley. 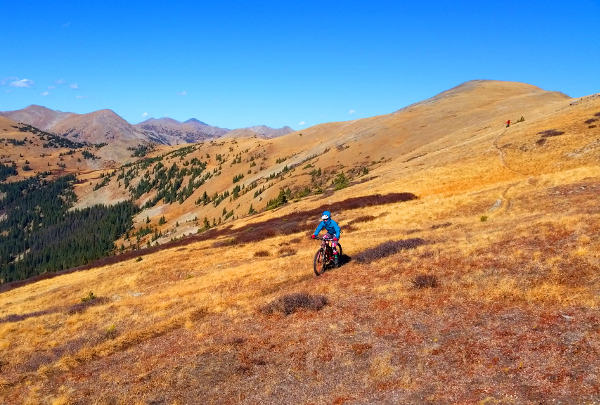 The Continental Divide / Monarch Pass Region of TrailQuest harbors some of the best alpine riding in the area. And, once you venture off the heavily-traveled Monarch Crest trail, it’s not hard to find yourself on a trail all to yourself!